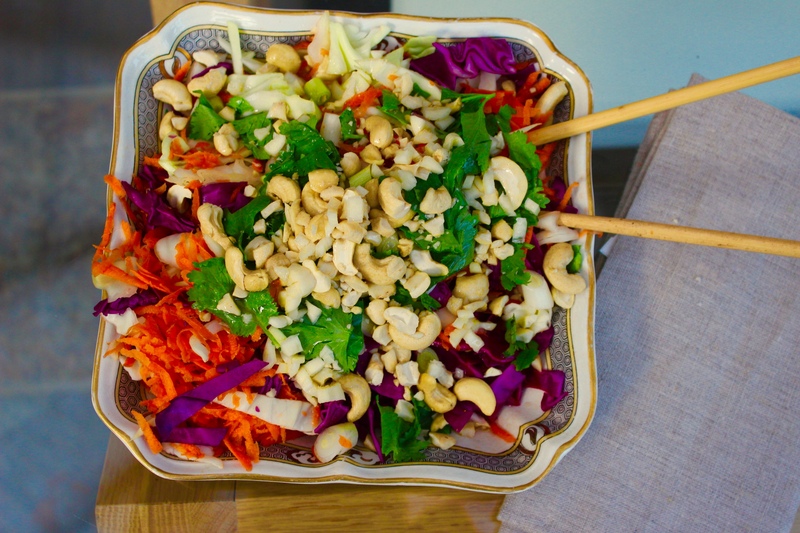 This light seasonal healthy Thai Slaw is packed full of delicious Thai flavours, protein & complex carbohydrates which support the balancing of your blood sugar levels & provide you with plenty of dietary fibre. Wash & dry both cabbage portions & thinly slice in to a large bowl. Grate carrots & finely slice the spring onions & mix together with the sliced cabbage. In a small bowl whisk the rice vinegar, soy sauce, sesame seed oil with the crushed garlic, chopped coriander & parsley. Pour the dressing over the vegetable mixture & mix well together. Before serving mix sesame seeds & crushed peanuts to mixture & serve immediately. This dish provides an important portion of cruciferous vegetables, which are beneficial for so many health conditions. Ranging from helping to support people with ulcers, liver disorders, constipation, reducing chest congestion & so many more. They are an excellent source of vitamin C & beta-carotene (especially Chinese red cabbage,) antioxidants that help prevent macular degeneration & arthritis. They also support the maintenance of healthy skin & hair. Cruciferous vegetables are known for being low in calories,, & helps people trying to lose weight. Red cabbage is rich in quercetin, an anti-inflammatory antioxidant that acts as a natural protection against hay fever & research suggests that it may help prevent arthritis & age-related memory loss. I always recommend eating cruciferous vegetables raw or lightly cooked to preserve the vitamin content. The only warning I would highlight about cabbage would be to IBS sufferers as some can be sensitive to cruciferous vegetables & may experience discomfort after eating them. The nuts & seeds in this dish provide additional protein & flavour. Sesame seeds provide you with copper, manganese, calcium, magnesium, phosphorus, iron, zinc, vitamin B1, & fiber. They provide you with specific fibers called lignans, & research shows these have cholesterol-lowering effects. Additionally they contain one unique substance called sesamin, which has been found to protect the liver from oxidative damage. Peanuts despite their name are not nuts but actually belong to the legume family, such as lentils & beans. For people with nut allergies the distinction is important as they can eat them safely. They are a rich source of potassium, which acts as an electrolyte, this mineral is required for keeping the heart, brain, kidney, muscle tissues & other important organ systems of the human body in good condition. Peanuts provide a good balance of monounsaturated & polyunsaturated fats that keep the heart healthy & lower blood cholesterols levels. They also provide additional crunchy texture and flavour to this dish. This dish can be enjoyed by everyone without them even realizing it is gluten free, vegan & healthy.